Access: Located just behind the Costila refuge. Character: Two pitches alpine routes and one pitch sport routes. Conglomerate. Bolting: The alpine routes are on pitons. Sport climbing ones are equipped with expansion bolts. Retreat by abseil. The left most route. Mostly crack climbing. Free climbing difficu.. The left most route. Mostly crack climbing. Free climbing difficulty: 6c (crux in the second pitch). Easy route which does not go beyond 5c if free-climbed. Two hard pitches for the ones addicted to adrenaline! First ascent in 1975 belongs to a team of Czech climbers. Free cl..
First ascent in 1975 belongs to a team of Czech climbers. Free climbing grade: 7a. The first pitch starts by traversing left and then continues upwards the face with crack. The second pitch goes along a crack system with an overhang in the middle part. Belay stance shared with Hermann Buhll. In the third pitch traverse right, then upwards, right, and upwards to the belay stance. The final fourth pitch goes upward and right over cracks and overhangs. You need several narrow carabiners. The first pitch starts with a..
You need several narrow carabiners. The first pitch starts with a small crack then continues upwards the face. The second pitch traverses left, then right and then continue upwards the face for a few meters. Then go upwards and right to the belay stance. In the third pitch start by traversing right to cross Hermann Buhll route. Continue to the right, then upwards and then again right. The fourth pitch goes upwards along an arcadecrack upward and left, then straight up. First ascent in 2008 by Titus Gontea. The route starts just right..
First ascent in 2008 by Titus Gontea. The route starts just right of Hardy, and ends at the top Tancul Mic, a bit left from the exit of Suzana. The excellent rock quality and diretissima character make out of this route one of the finest in the area. Most difficult pitch is the third one. The route is also known as Din Dragostea Ramasa. First pit.. The route is also known as Din Dragostea Ramasa. First pitch is rated at 6c and the second one at 6b. Take a 70m rope! First ascent in 1999 by George Stroie. The route follows a sinuou..
First ascent in 1999 by George Stroie. The route follows a sinuous line over faces and overhangs. Intersects Hermann Buhll. First ascent made by Dan Vasilescu and Doru Vasilescu in 1966. Fr..
First ascent made by Dan Vasilescu and Doru Vasilescu in 1966. Free climbing grade: 6b. The first pitch starts with an overhanging crack, then a traverse to the right, followed by a compact face. Exit over a huge bulge. Belay stance. There is a variation of the entry (author Marius Gane), a bit lower, which starts on an overhang upwards and left, and then you meet the original entry. In the second pitch traverse descending to the left, then climb a chimney to reach a vegetation covered ledge. The third pitch continues upwards and left. In its final part you traverse under an overhang. Continue on same line in the fourth pitch, passing successively a chimney followed by a crack, and then a small overhang. The last pitch goes upwards along a chimney, then exits on the ridge. The descent is the same for all routes that end on the crest of Tancul Mic. You need some narrow carabiners. The routes Pasarea cu Barba and ..
You need some narrow carabiners. The routes Pasarea cu Barba and Soricelul share the first part (first ascent by Gheorghe Enache). The rest of the pitches have been bolted by Dan Florescu (who also owns the first ascent of Hardy). Take some narrow carabiners with you. Start with an overhanging c..
Take some narrow carabiners with you. Start with an overhanging crack, then you leave this first section shared with Pasarea cu Barba, upwards and right. After the first belay stance you intersect Fisura Insorita, then continue on the right of Fisura Insorita. Free climbing grade: 6c+. 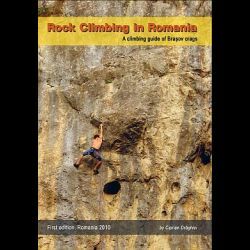 First ascent made by Gheorghe Enache an..
Free climbing grade: 6c+. First ascent made by Gheorghe Enache and P. Pascu in 1951. Start the first pitch on a dihedral, traverse an overhang to its left, then climb upwards and right along a dihedral. In the second pitch traverse left and straight up. The third and the fourth pitches are easy terrain. Descend by abseiling or continue walking on the crest until you reach a pass from where abseil using a tree as anchor point. First ascent made by Fl. Stan and P. Pascu in 1956. Free climbing grade: 6a. The first pitch starts on the right end of Tancul Mic. Avoid the overhanging section on its right, then continue upward and right to a small tree. Belay stance. In the second pitch traverse right to to the base of a crack. Climb along that crack, traversing successively to the right. The third pitch goes along a crack, then pass successive ledges traversing right. Continue in the fourth pitch on easy and grassy terrain until you reach the top of the pillar. Descend by abseil or continue walking on the crest until you reach a small pass. From here abseil using a tree as anchor.